It is here! Just in time for pool parties, backyard barbecues and summer adventures; Tea Collection's Semi-Annual Sale is featuring the entire Morocco line at up to 50% off! 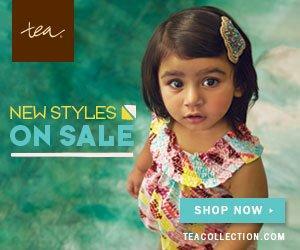 I have never heard of Tea, but they have some very cute clothes. I am going to have to order some for my little man. I have never heard of the Tea Collection, but this is a great site. Thanks so much for share and I always love a wonderful deal!